Group of pirogues at sunset on the river bank of Don Tati, Si Phan Don, Laos. 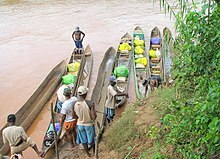 A pirogue (/pɪˈroʊɡ/ or /ˈpiːroʊɡ/), also called a piragua or piraga, is any of various small boats, particularly dugouts and native canoes. The word is French and is derived from Spanish piragua [piˈɾaɣwa], which comes from the Carib piraua. 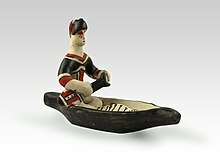 Pirogue does not refer to a specific kind of boat, but is a generic term for small native boats in regions once colonized by France and Spain, particularly dugouts made from a single log. In French West Africa, pirogues refer to handcrafted banana-shaped boats used by traditional fishermen. In Madagascar, it also includes the more elaborate Austronesian lakana outrigger canoe. Pirogues are usually propelled by paddles that have one blade (as opposed to a kayak paddle, which has two). It can also be punted with a push pole in shallow water. Small sails can also be employed. Outboard motors are increasingly being used in many regions. Pirogues were used by Lewis and Clark on the Missouri River and westward from 1804–1806, in addition to bateaux, larger flat-bottomed boats that could only be used in large rivers. Their pirogues referred to the medium-sized boats of the company carrying eight rowers and a pilot, capable of carrying eight tons of cargo. Henry D. Thoreau writes of using heavy pirogues in his book "The Maine Woods". Pirogues in the United States is associated particularly with the Cajuns of the Louisiana marsh. The early Cajun pirogues were cypress dugouts but today they are usually flat-bottomed boats. Pirogues are not usually intended for overnight travel but are light and small enough to be easily taken onto land. 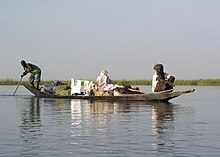 The design also allows the pirogue to move through the very shallow water of marshes and be easily turned over to drain any water that may get into the boat. A pirogue has "hard chines" which means that instead of a smooth curve from the gunwales to the keel, there is often a flat bottom which meets the plane of the side. Doug Kershaw's 1961 hit "Louisiana Man" includes the line "..he jumps in his pirogue headed down the bayou". Many online lyrics sites misunderstand this line, saying 'hero' or sometimes 'biro' instead. ^ "Among the pirogues of Africa". Voyage to the Sargasso Sea. Retrieved 2 May 2018. ^ "Sakalava pirogue". Alefa. Retrieved 2 May 2018. ^ Dirimtekin, Feridun (1956) Fetihden Once Halic Surlari. Istanbul, Istanbul Enstitusu. ^ a b Marley, David F. (2010). Pirates of the Americas, Volume 1. ABC-CLIO.